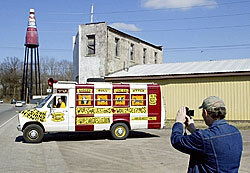 Mike Gassmann, a Giant Catsup Bottle enthusiast and promoter, takes a photograph of artist Erika Nelson in front of the attraction in Collinsville. Nelson checked out the bottle on her way to Delaware with her traveling museum of the World's Largest Collection of World's Smallest Versions of World's Largest Things Traveling Roadside Attraction and Museum. Do big things really come in small packages? Check with Erika Nelson. There's little doubt on how she'll answer. Based in Lucas, Kan., Nelson regularly grabs the steering wheel of her portable exhibit and hits the road. Her wildly decorated Ford Econoline 350 is nothing less than a roadside attraction brimming with roadside attractions. It's just that these attractions are, well, smaller than life. Such as? Such as a three-inch high model of a 170-foot tall Brooks Catsup bottle. The larger structure, of course, can be found in Collinsville. And, for a few days last week, so could the impish impersonator: Nelson finished up a several-day stop in the St. Louis area by parking her museum along Main Street in Collinsville's downtown business district. It had been a whirlwind of activity for the artist/curator. On the west side of the Mississippi, she checked out a massive bowling pin, a humongous bottle of Vess soda, the gargantuan Amoco sign at Clayton Road and Skinker Boulevard, and a King Kong-size pair of underwear at the City Museum. A former art professor at the University of Kansas, Nelson, 31, is slowly making her way east toward a month-long residency at the Delaware Center for Contemporary Arts. Big things - the majority of which inhabit small towns - dot the map of her travel itinerary. The attraction seems to have started at an early age. Growing up in the Missouri Ozarks, Nelson found herself fascinated by the World's Largest 8 Ball in Tipton (home of a major billiards plant). She figured that every community must have a similar sort of quirky, iconic structure on its landscape. She later found out otherwise. But the fascination never faded. Then, when visiting the World's Largest Ball of Twine in Cawker City, Kan., Nelson decided that the gift shop replica of the lurking string ball could be improved upon. So, she created a tiny version of her own. That was only the beginning. Smaller things were yet to come. The biggest badgers, pecans and gas pumps found themselves miniaturized at the hands of Nelson. The world's largest loons - talking, floating and plain old generic loons - were reduced to the size of Weebles. In its own way, this was a form of folk art. But it also was a way for the artist to assist and connect with the small towns that she so dearly loves. educator. "I started doing the small replicas, then decided to combine everything into this traveling roadside attraction." Collinsville fits the Nelson ideal of a tight-knit community seeking to keep hold of its heritage and identity. The Main Street business district still has that old-school, small-shop feel. The ketchup bottle stands as a reminder of the kind of kitschy and fun design that likely wouldn't fly in these times of restrictive ordinances. Painted just below the dashboard in the museum van is the following phrase: "Combating Generica." It's a kind of mission statement. And you get the feeling that Nelson lives and breaths it. The inside of the Econoline is both a walk-in exhibit space and makeshift living quarters. If no lodging is readily available during one of Nelson's tours (this is her fifth since inaugurating the road show in 2001), she simply parks and makes herself at home. Her trip to Collinsville was a return visit, and one with a purpose. Although Nelson photographed the ketchup bottle back in 1999 and then created her miniature about a year ago, it was now time to complete the process: a still-life portrait featuring both the original and its offspring. The artist spent a couple of days doing just that. But back on Main Street, her van parked in a lot between Jim's Pawn and Jewelry and the Smock, Paper, Scissors art academy, Nelson recalled how a local critic had just hours before mentioned that the condiment cousins hadn't quite reached the look-a-like stage. "A man did berate me today for my choice of the tower structure," Nelson says. She does so with a huge smile, fully realizing that the local guy only wanted to see his cherished symbol of bottled pride done up right. "He said that I need to take it off this base (a chrome piece resembling a mini nuclear cooling tower) and put it on one that resembles all the (frame) towers that I have on display." Nelson promised the fellow that she'd alter the model at some point, change the base to something more akin to the original. For some artists, such a request would be no small matter. But for this one, it appeared to be no big deal.